In Turkmenistan, schools with the intensive learning of different subjects will introduce a fee of 100 manats ($ 28.5) per month for pupils of primary grades and 150 manats (about $ 43) a month for high school students, Alternative News of Turkmenistan (ANT) reports. According to the edition, the regional education departments and local administrations discussed the introduction of the fees at their meetings this week. Although, there is no official confirmation of this information yet. 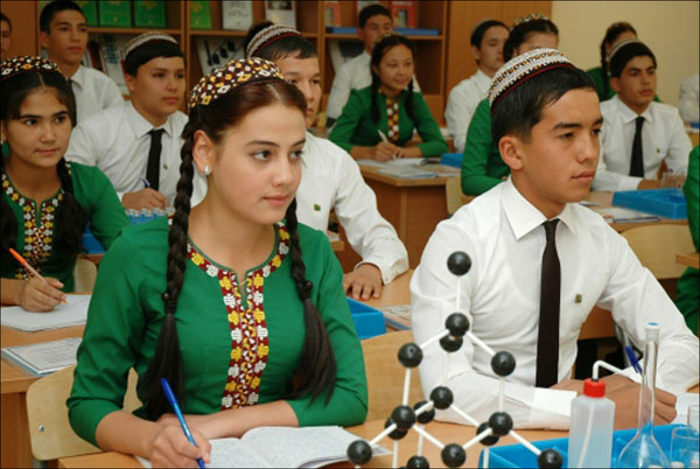 There are schools with the intensive learning of foreign languages or sciences, for example, mathematics and physics, in each region of Turkmenistan. Local observers believe that, due to a lack of money for school, many parents will begin to transfer their children to ordinary schools. Earlier, the "Chronicle of Turkmenistan" reported that the people are concerned about rumours that ordinary schools would charge its fees (the sum of 100 manats for each child was called). However, the schools posted a notice that they will charge no fee. According to the Constitution of Turkmenistan, "general secondary education is compulsory, every person has the right to receive it in state educational institutions for free." The effect of this provision does not apply to educational institutions with the intensive learning of subjects. After the meeting of the Council of Elders held on 9 October, the Turkmen authorities decided to increase tenfold the monthly childcare fees from 8 to 80 manats per child (from $ 2.3 to $ 23 at the official rate). Up to 40 manats ($ 11) for families with three or more children, and up to 10 manats ($ 2.5) for single mothers. This news provoked a spontaneous protest in Dashoguz (a city in the north-east of the country) on 10 October. About 200 protesters gathered outside the city administration building. Most of them were women, while many of them carrying children. Many protesters raise three or four young children. They do not have money to pay for a nursery. A similar action held in Boldumsaz district, where several dozen disgruntled parents came to the district administration. According to the source of Azatlyk news agency (Radio Liberty regional service), the officials told the protesters that the childcare fees increased because of benefits to water, gas and electricity cut for nurseries. Parents began withdrawing their children from nurseries after the childcare fee grew tenfold. In the Mary velayat (an area in the south-east of the country), nurseries, according to ANT, are half-empty. Turkmenistan experiences the consequences of the falling oil prices in 2014. Due to the decline in oil revenues, the government approves a deficit budget. Public sector employees face wage arrears. At the same time, prices for consumer goods are growing, and some of them are becoming scarce. Recently, President Gurbanguly Berdymuhamedov announced the cancellation of the remaining privileges - quotas for free electricity, gas, and water. Benefits, along with previously cancelled free gasoline, the government introduced under the late president Saparmurat Niyazov. Announcing their cancellation, Berdymuhamedov said that there is no need for them - allegedly due to the improvement of the economic situation and the increase of the population's incomes.